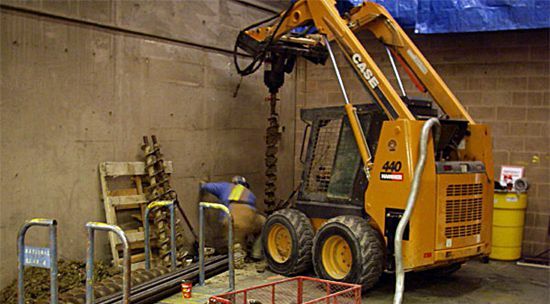 The Canada Post McKnight Mail Processing Centre Expansion project involved the installation of micropiles to support a renovation within the facility in northeast Calgary, Alberta. As the project was undertaken in an active mail processing facility, the execution presented a number of challenges. Due to the nature of the building, HCM had to deal with limited access and low overhead clearance. Notably, there was a requirement that forbade any emissions within the building from operating equipment. This resulted in restrictions on the mobilizing of equipment, where fuel-powered engines could not be used. To solve this problem, the equipment was moved into place using an electric forklift. To satisfy the zero emission policy during work, a ducting system was conceived that vented the exhaust from the operating machines to the outside air via a connection through the roof of the building. The nature of the facility also meant that work had to be conducted on weekends, when operations at the mail facility are light. HCM’s crew had to abide by security restrictions which limited access to specific parts of the building. Despite the challenges, the project went well with HCM’s scope of work being completed in two days. 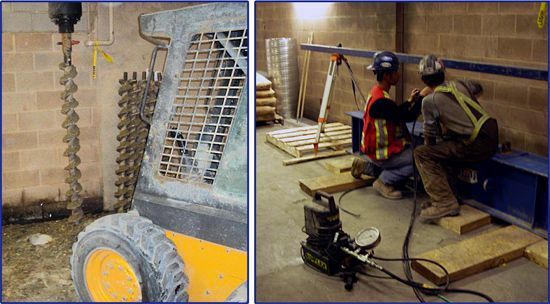 To achieve the required capacity of the micropiles, post-grouting was required. Seven days after the installation, the piles were load tested to 150%.